Potatoes, corned beef, tomato sauce, and onions all mixed together and cooked in a skillet long enough to make the potatoes soft and the onions slightly caramelized. YUM. My mom used to make this in Africa, and it is such a warm, filling meal. I even made up a dance for it in high school when my mom would make it for me. I love making bread. It’s an enjoyable process, and I can work out a lot of frustration in kneading! 😉 Also, it’s delicious straight out of the oven and a perfect accompaniment to sweet butter (i.e. unsalted), which I prefer to salted butter. I love dinner rolls, sweet breads, baguettes, whole wheat, white bread–you name it, I like it! 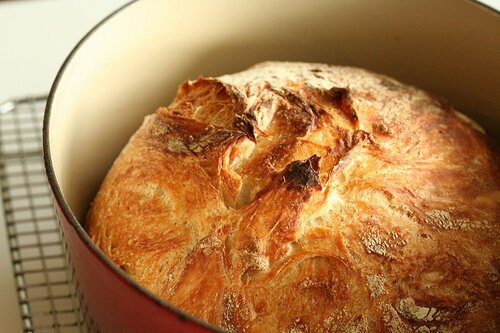 My favorite recipe actually calls for minimal kneading and can be found here. Also, it’s delicious with homemade jams! So there you have some of my favorite comfort foods! I’m curious, what are yours? This entry was posted in blog challenge and tagged 30 day blog challenge, adobo, blog challenge, bread, comfort foods, corned beef hash, no-knead bread by Ellayne Shaw. Bookmark the permalink.